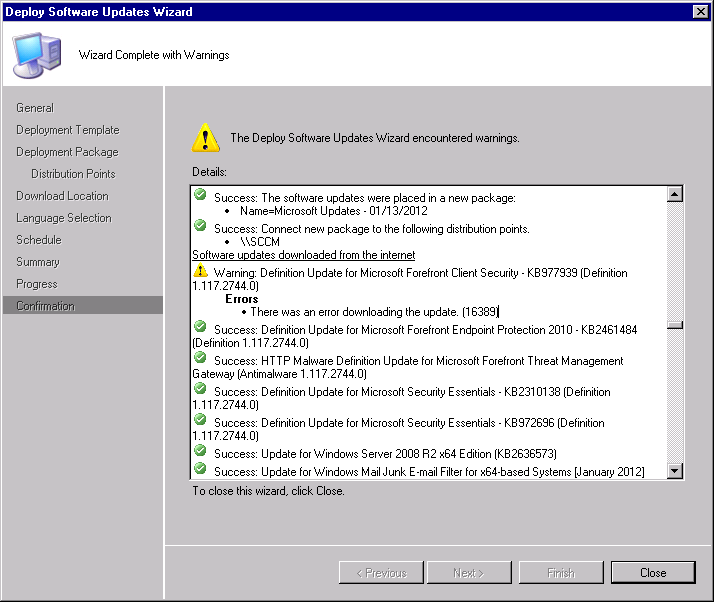 Deploying Microsoft updates through SCCM is easy once the Software Update Point is installed and synchronized. 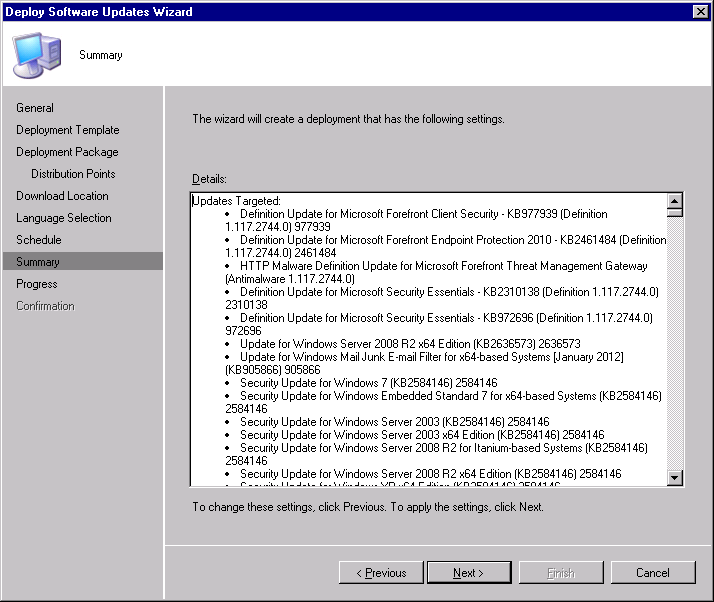 Create a search folder to select which updates to install. 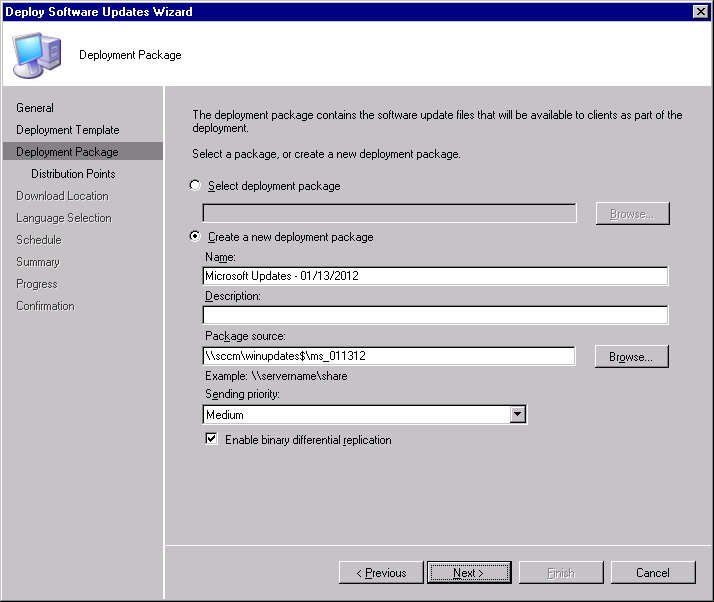 Create a deployment package for the updates. 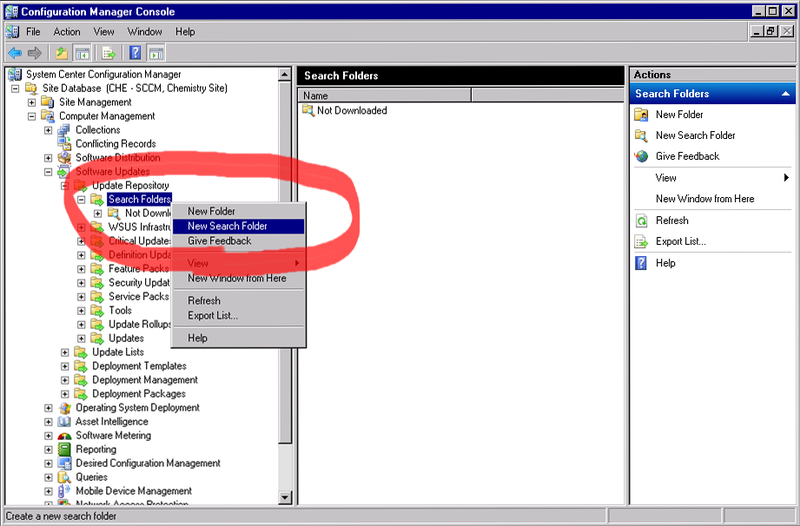 Navigate to Software Updates -> Update Repository -> Search Folders. Right-click “Search Folders” and choose “New Search Folder”. 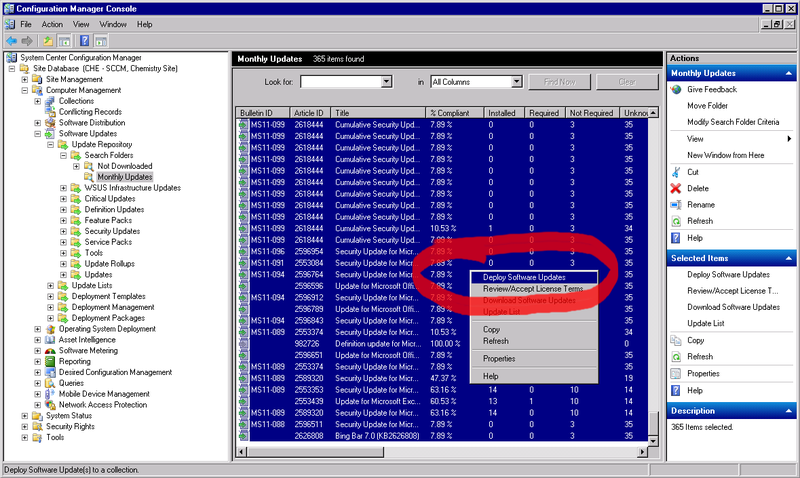 On the ‘Search Folder Criteria” screen choose “Date Released” then “Last 1 month” for the value. Then, check the box “Search all folders”. 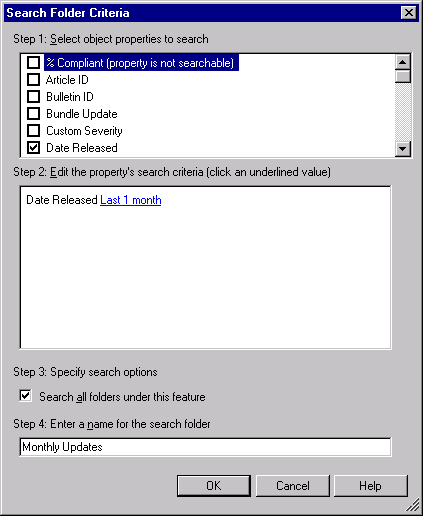 Finally, enter “Monthly Updates” as the name and click “OK”. After a short time (1 min), the search folder will be populated. 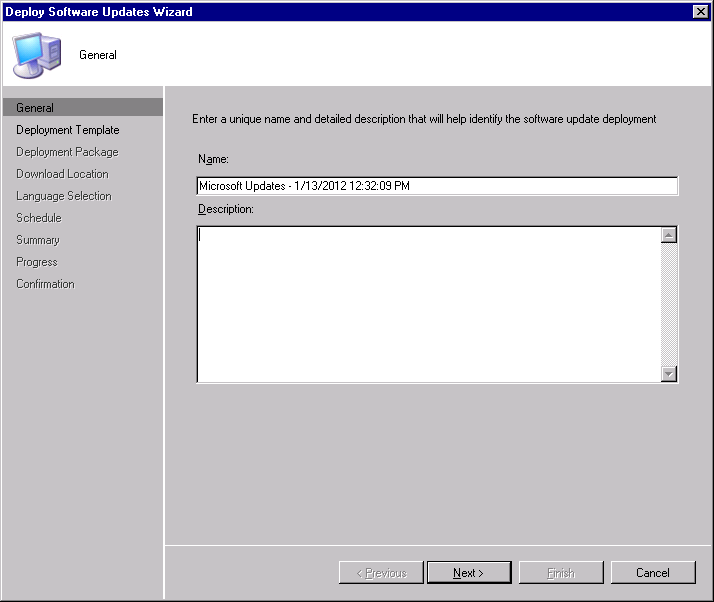 Navigate to Software Updates -> Deployment Templates. 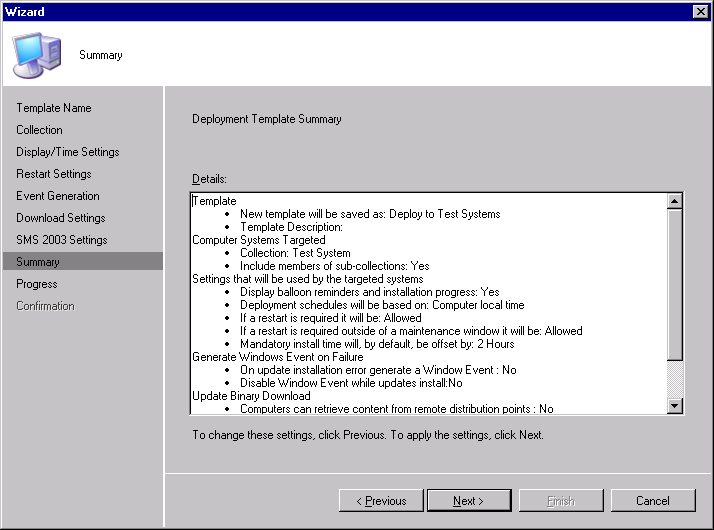 Then, right-click “Deployment Templates” and select “New Deployment Template”. 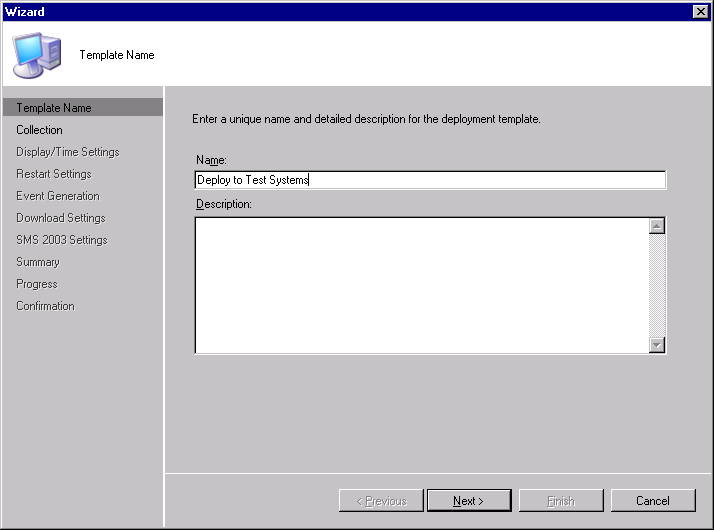 On the ‘Template Name’ screen enter a name such as “Deploy to Test Systems” then click “Next”. 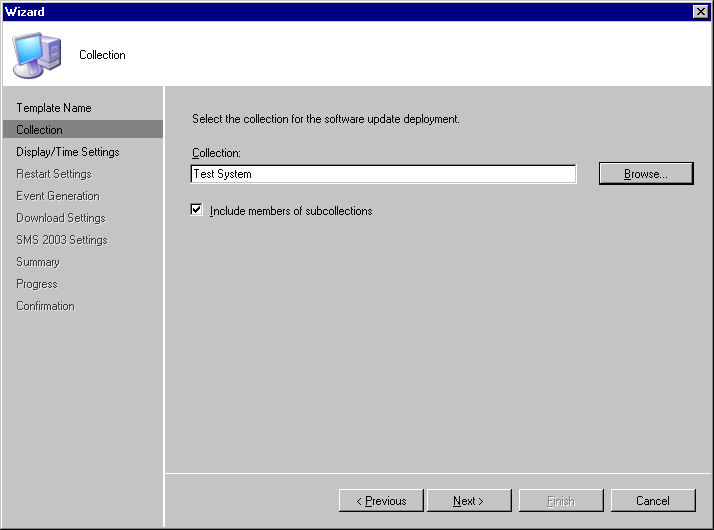 On the ‘Collection’ screen target the template to a specific collection. I selected my collection of test computers. When finished click “Next”. 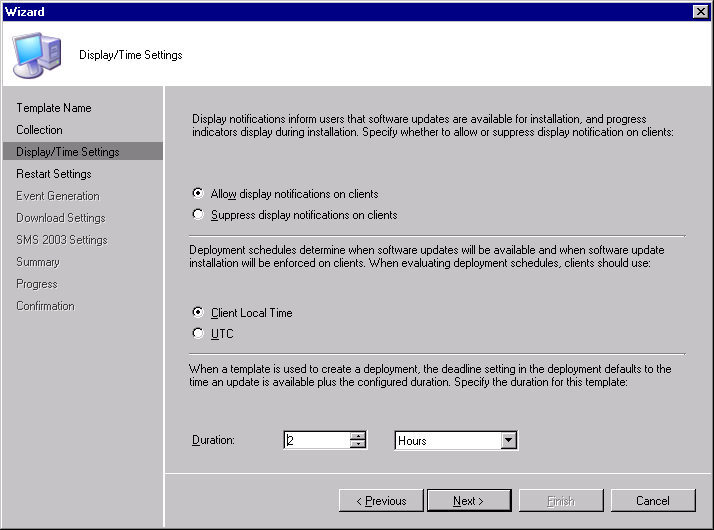 On the ‘Display/Time Settings’ screen, I selected “Client Local Time” and a deadline duration of 2 hours. When finished click “Next”. 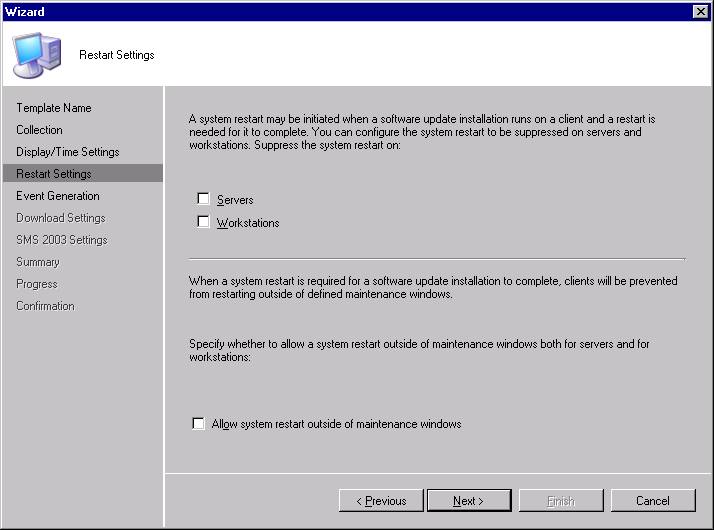 On the ‘Restart Settings’ screen click “Next”. On the ‘Event Generation’ screen click “Next”. On the ‘Download Settings’ screen click “Next”. 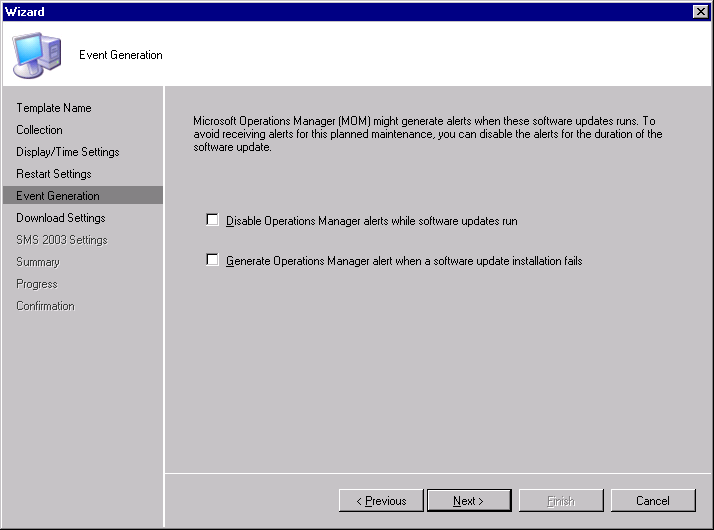 On the ‘SMS 2003 Settings’ screen click “Next”. On the ‘Summary’ screen click “Next”. On the ‘Confirmation’ screen click “Finish”. 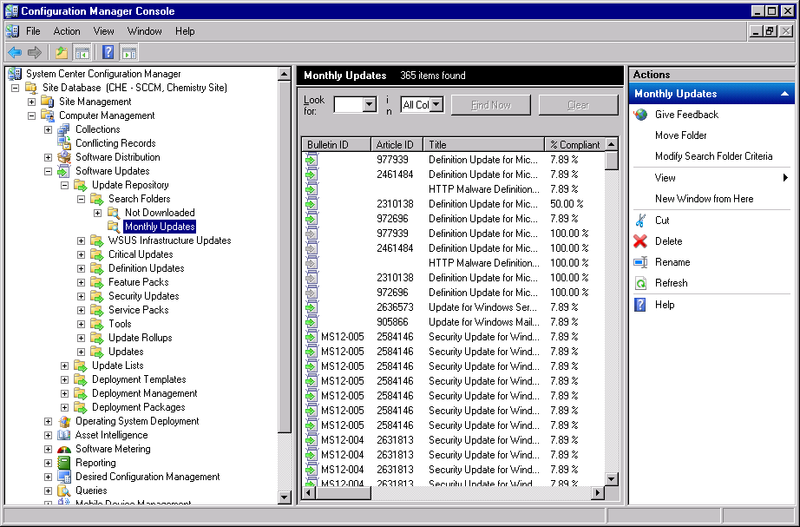 Navigate back to Software Updates -> Update Repository -> Monthly Updates. 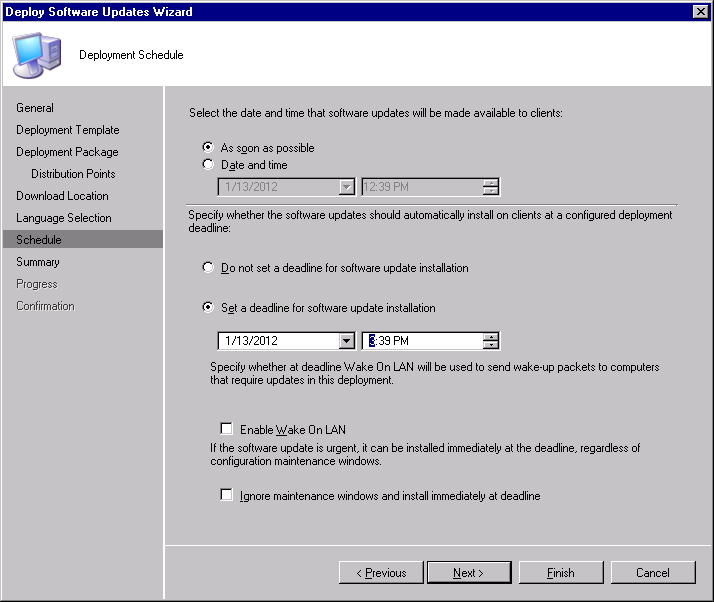 Highlight all of the updates you’d like to deploy, then right-click and select “Deploy software updates”. Most likely, a message box containing a warning about expired or metadata-only updates will appear. Click, “OK”. 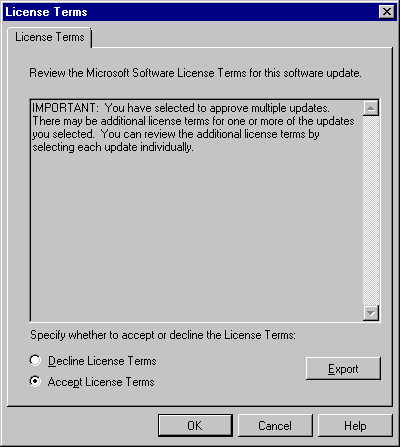 On the ‘License Terms’ screen, choose “Accept License Terms” and click “OK”. On the ‘General’ screen click “Next”. 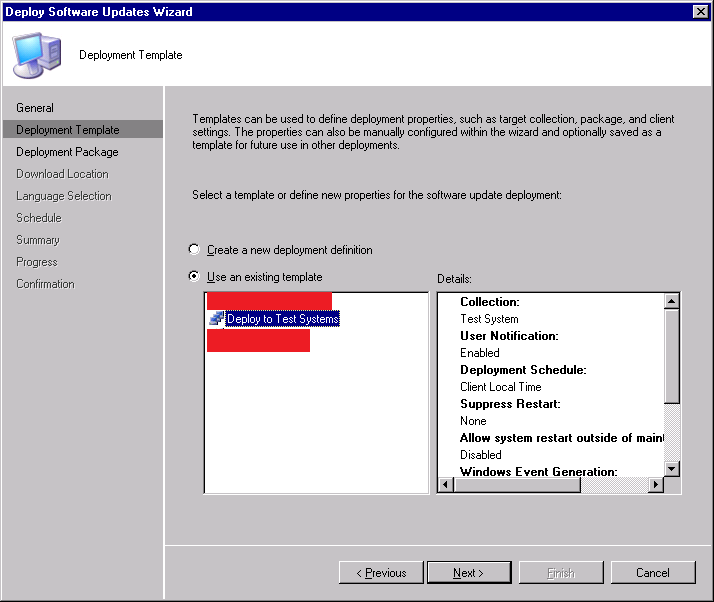 On the ‘Deployment Template’ screen choose your existing template then click “Next”. 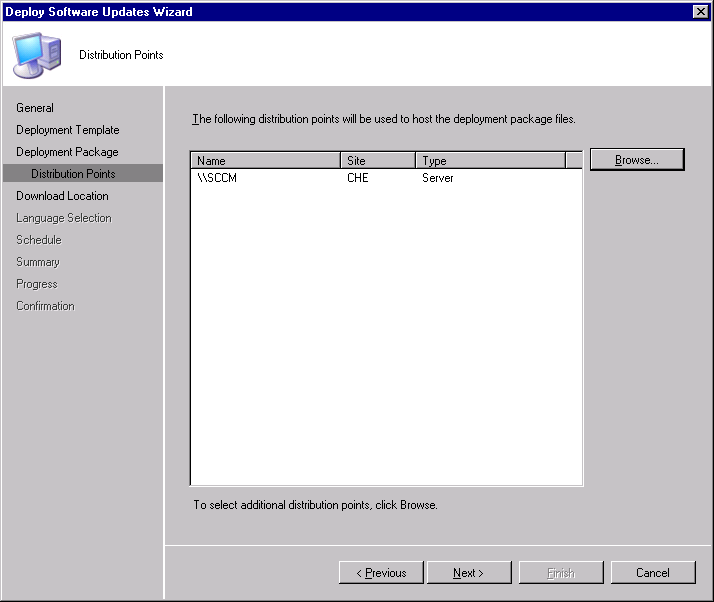 On the ‘Deployment Package’ screen choose “Create a new deployment package” then enter a name, path for the source files to be stored, and check “Enable binary differential replication”. When finished click “Next”. 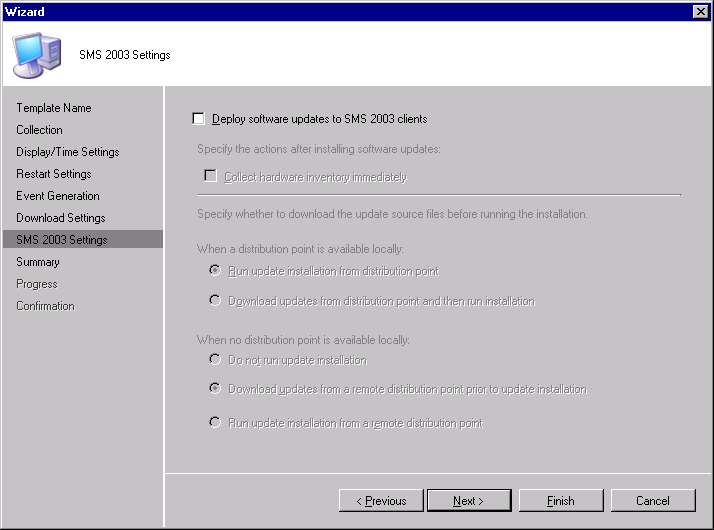 On the ‘Distribution Points’ screen, choose “Browse” then select your distribution point. When finished click “Next”. 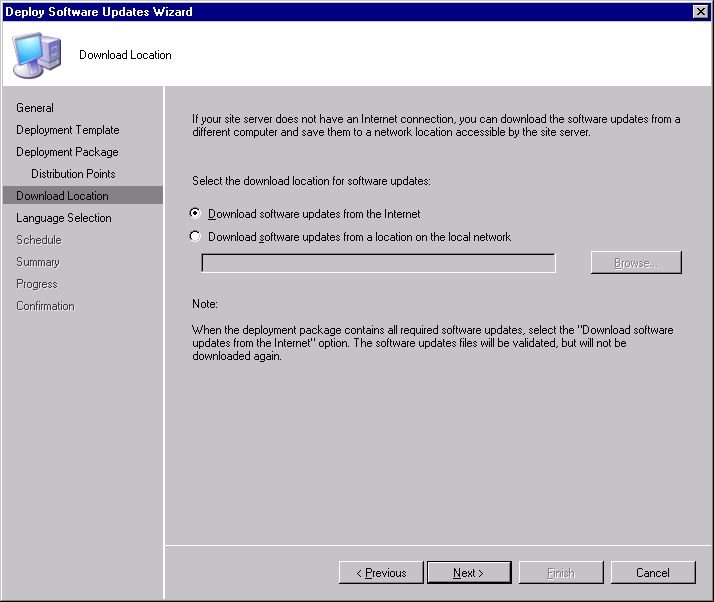 On the ‘Download Location’ screen, leave the default of “Download software updates from the Internet” then click “Next”. 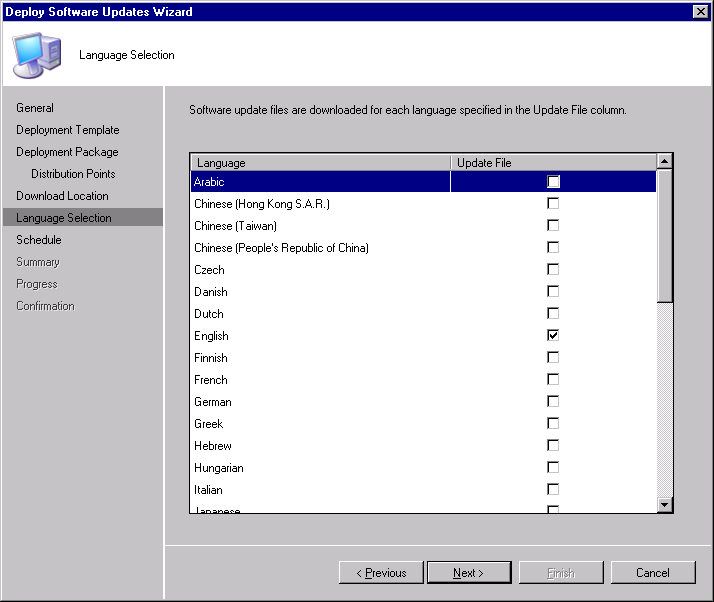 On the ‘Language Selection’ screen choose any language editions of updates you require then click “Next”. On the ‘Deployment Schedule’ screen change the deadline to a time in the future then click “Next”. 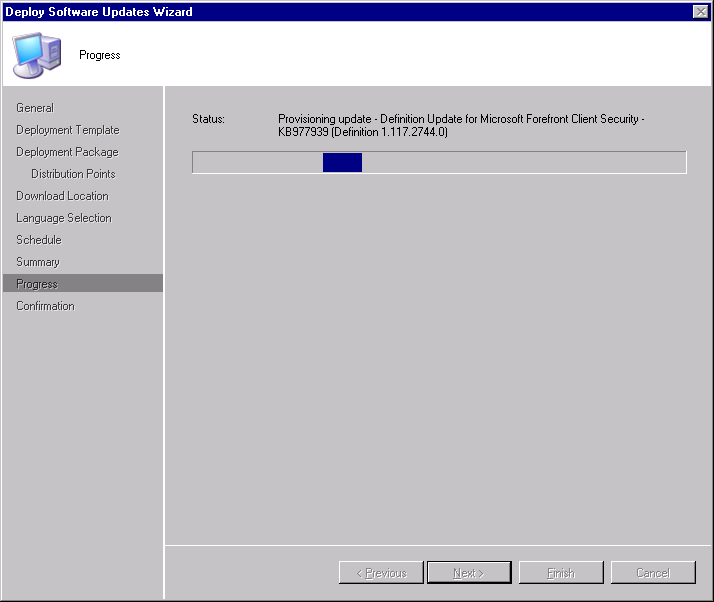 On the ‘Progress’ screen wait for SCCM to download all of the updates. On the ‘Confirmation’ screen click “Finish”. Occasionally there are download issues on some updates. 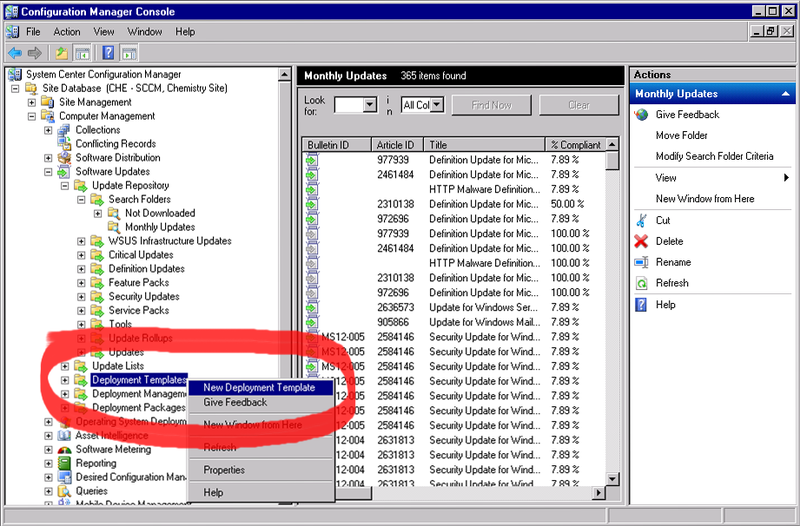 You can right-click the update and click “Download”, then try the deployment again if desired. Congrats! You’ve deployed updates! 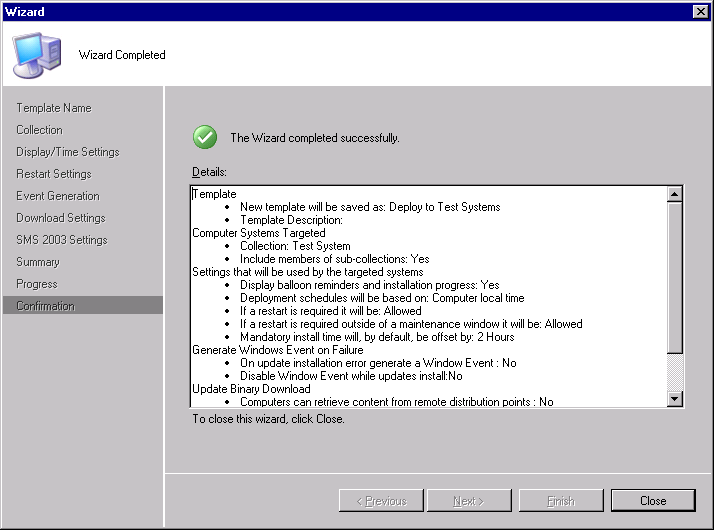 Part 3 will cover initiating a client scan and the end-user experience.